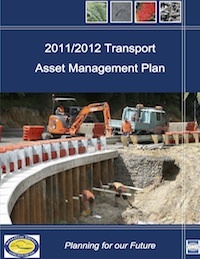 The Whakatane District Council – Transport Asset Management Plan is available here. The Whakatane District Council TAMP outlines the agency’s strategic goals and provides a framework for an integrated planning practice, linking Asset Management Plans to the Long Term Plan and Annual Plans. The plan contains thirteen sections, including chapters on level of service, a business overview, growth and demand, risk management, life cycle management, financial forecasts, and an improvement plan. This document includes the following sections: Asset Valuation, Communications and Reporting, Current Methods and Tools, Environmental Sustainability, Financial Plan, Future Demand, Introduction, Inventory and Condition, Investment Strategies, Levels of Service, Lifecycle Management, Objectives and Measures, Process Improvements, Risk Management.